Can a utility be an art? Jason Gould was hard at work on a mid-week afternoon, with the echo of drills and the beep of cement trucks in the background. As cranes and construction crews slowly transformed the upward-climbing landscape of Downtown’s Columbia District, Jason stood below, next to a cluster of utility boxes covered with tape and various colors of blue. The blue reflected the tint of the windows being installed above. A can of paint and a roller rested on the ground next to his feet. Gould was also transforming the streets of the Columbia District — in his own way. If you haven’t taken a stroll through the Columbia District in a while, now might be a good time. Not only is the skyline changing day by day with the installation of new buildings, but things are happening on the ground level with the painting of some of the neighborhood’s utility boxes. As founder of Visual Urban Contemporary Art, Gould’s gallery and supply shop in North Park, he has had a much further reach than just a small storefront on 30th Street. Over the years, he has developed and nurtured a network of talented San Diego artists. In this way, his work is a lot like what happens at the Downtown San Diego Partnership. Gould builds connections with talented individuals who help transform the streets of San Diego, and therefore the everyday experience of regular and visiting pedestrians. Having coordinated similar public art projects in neighborhoods like North Park, Normal Heights, and City Heights, Jason and his team are no strangers to this type of work and, thus, the perfect group to partner with in coordinating this project — not just in the Columbia District, but in all of Downtown San Diego. Whereas his other neighborhood projects have been a bit more free-form and individualistic, Gould said he sees his role in Downtown as more akin to a curator. In a neighborhood like the Columbia District, that means finding the connection between art and the current development. 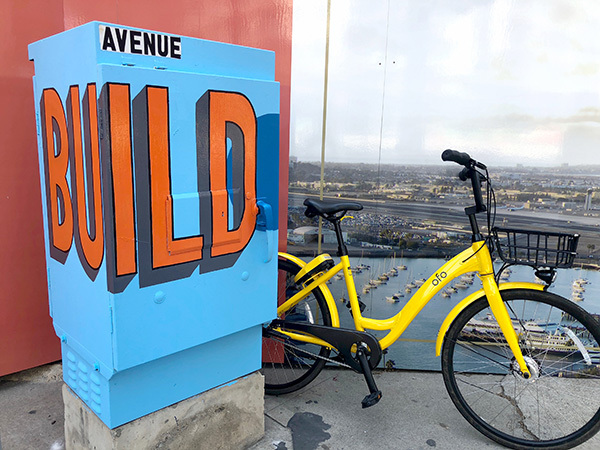 Take a walk to the corner of W. Ash Street and Kettner Boulevard and next to the construction, you’ll find a box with the word “build” carefully painted on a background of orange — purposefully chosen by artist Nat Iosbaker to resonate with the vibe of that particular site. However small they may be, it’s not hard to see the crucial role painted utility boxes and other public art projects play in creating and sustaining a vibrant urban core. Public art serves as a form of community activation that not only makes for a more pleasant walk down the street, but also reflects and shapes the character of a neighborhood in a way that has broader implications for business and resident attraction and retention. Turning monochrome utility boxes into art is just one step toward transforming Downtown neighborhoods. The San Diego City Council recently passed legislation that would simplify, and make less expensive, the process for community members to implement place-making efforts. This is a concept we’re passionate about here at the Partnership. Perhaps later this year, visitors and residents of the Columbia District will be able to enjoy the utility boxes not just en route to the next destination. They could park their bike and relax for a moment at a street-side parklet made possible by the ease of the place-making process. For now though, you might be able to see the artists at work — to take part as a community in the activation and future of a burgeoning Downtown community. 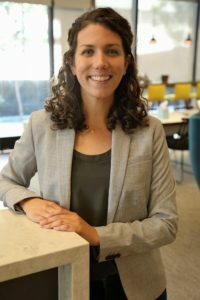 — Lana Harrison is the communications coordinator for the Downtown San Diego Partnership. She can be reached at lharrison@downtownsandiego.org.